Sriracha (to taste) 3 tbsp. Ventura Foods Teriyaki Sauce 1 tbsp. Ginger, peeled, finely grated 2 tsp. Arrange wingettes in 1 layer in baking pan and roast, turning once, until cooked through, about 35 minutes. Meanwhile, prepare sauce by combining all sauce ingredients in small saucepan. Bring boil over medium-high heat; reduce heat and simmer for 10 minutes until slightly thickened. Remove from heat. 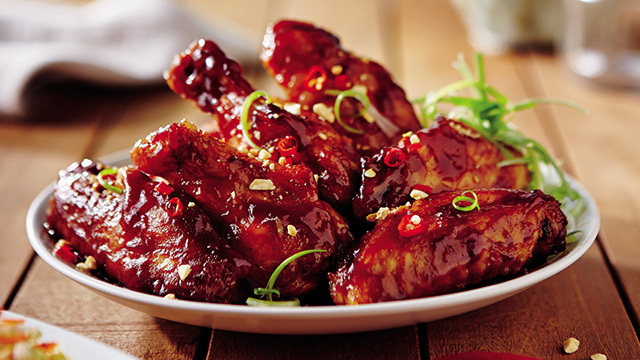 Toss cooked wings with sauce and return to oven for additional 10 minutes. Top cooked wings with peanuts, green onion, and chiles.